On the way back home from Provence this summer, I found an old lady selling boxes of apricots, nectarines, and garlic, off the long and narrow cypress lane. I had to stop and look at the beauties of her labour of love. The colour of these apricots is difficult to describe- I had never seen such a manifestation of intense orange. The scent of the fruit was waking my senses up! Certainly, I had not come across such big and firm apricots in recent years. It brought back the memory of my childhood: when my grandma gave me a couple of apricots, I would gulf them down in no time at all. These apricots had right amount of acidity subtly hidden in the ocean of sweetness! The GREEDY me had to buy a big box. 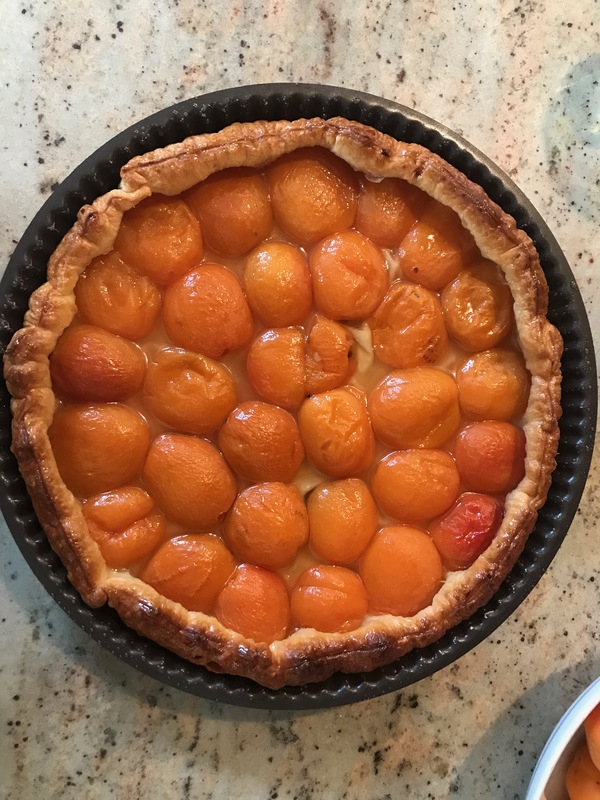 After a few days, we couldn’t eat all these gems so I ended up making an apricot tart, jars of apricot jam, and squares of apricot jelly. I learned a basic recipe of a summer fruit tart from our Nonna: An Italian mother-in-law of our nanny. I found my favourite method after many trials over the years. This is SO simple that you can make it between practices for your family and friends! What you need is puff pastry, brown sugar, and honey! That is all! 1. Turn the over to 220C. 2. Sprinkle with the sugar on the pastry. 4. Sprinkle with the sugar again. Bake in the LOWEST part of the oven for about 35-40 minutes until the colour has turned into golden brown. 5. Take it out the oven, and let it rest for about 5 minutes. 6. Brush the fruit and the pastry on the side with honey. It’s now ready to be enjoyed! I get something wrong, always!